Mike Oliver, Emeritus Professor of Disability Studies at the University of Greenwich in England, has died at the age of 74 after a short illness. A long time wheelchair user since the age of seventeen, a sociologist by training and author of many books including his landmark texts, Social Work with Disabled People (1983) and the Politics of Disablement (1990), and (with Colin Barnes), The New Politics of Disablement (2012).Oliver played a pioneering role in developing, with others such as Vic Finkelstein, what has come to be known as the social model of disability. The model builds from the proposition that it is structural barriers, such as a lack of wheelchair ramps or a failure to provide sign language interpreters, which impede disabled people rather than the impairments themselves. In other words, systemic barriers constitute an ableist society that disables disabled people and keeps them largely unemployed and in poverty. In every advanced capitalist country, disabled people face tremendous barriers in housing, transportation and employment. These barriers are so widespread and comprehensive that most individuals do not give them a second thought. By establishing and popularizing what has become known as the impairment-disability distinction, Oliver convinced disabled people to view the discrimination that they face daily as a matter of rights rather than a personal tragedy or medical problem. In other words, the fact that Jill has broken her leg means that she has an impairment, but she cannot get to class because the school does not have a functioning elevator. The inaccessible school is a disabling barrier that has to be remedied. It is difficult to convey how revolutionary the social model of disability was in crystallizing the consciousness of disabled people. Individuals who had spent years regarding their daily difficulties as a matter of personal failure and were socialized by an array of physiotherapists, occupational therapists and physicians to focus on rehabilitation were suddenly politicized as they came to realize that disability was indeed a political issue. Sometimes this has been misinterpreted as an attack on the medical profession. However, Oliver is very clear that the social model is not anti-medicine where medical intervention is required. Rather he is against ‘medical imperialism’, a mode of thought that regards disabled people as irremediably broken. Activists chose to prioritize different strategies. Many disabled people, more influenced by postmodern theories of language and the body, have tended to focus on cultural studies and the representation of disabled people in cinema, dance, and sports. Others have chosen to engage in law reform strategies such as advocacy for human rights legislation and test case litigation, with all its promise and perils, to seek social transformation. Still others have focused more directly on grassroots mobilization to challenge the austerity agenda of neoliberal governments – an anti-capitalist route. Certainly all have merits and, indeed, some have chosen to combine them but it is the last road that most closely corresponds to Oliver’s prescient vision of transforming the lives of disabled people for a better future. Oliver was deeply influenced by class politics and laid the basis for the still unfinished product of a materialist theory of disablement. He very much believed that the rise of capitalism and the factory system created disability. The requirements of wage labour as the dominant mode of production entailed the segregation and exclusion of disabled workers who could not maintain efficient production standards in an industrial society. As many scholars have noted, the very notion of time functioned differently in agrarian rural societies. Those who failed to conform and work at a pace set by Fordist factories were consigned to “workhouses, asylums, impairment-specific colonies and special schools and out of the mainstream of economic and social life” (Oliver and Barnes, p.55). Social Darwinism and eugenics provided an ideological justification for the exclusion of those individuals who could not conform to the requirements of industrial capitalism. As many scholars of ‘Mad Studies’ have noted, the actual impairments were often irrelevant. People incarcerated in psychiatric institutions notoriously did not necessarily have a formal diagnosis. As Geoffrey Reaume has shown in his book, Remembrance of Patients Past (2000), some were simply housewives who refused to conform to gender norms or even individuals who were misdiagnosed because they had acted in an unusual manner and spoke foreign languages that authorities could not understand. By associating ability with productivity, the workhouses and asylums served as a warning to the able-bodied population and stigmatized those who fall outside the boundaries of normality. Theories of eugenics of course entailed both stigmatization of disability with racial classifications that sought to exclude immigrants who were a danger to society. At its nadir, this culminated in the eugenics policies of Nazi Germany where hundreds of thousands of disabled people were exterminated in accordance with instructions from Hitler in 1939 but it is often forgotten that early twentieth century social democratic politicians around the world were enthusiasts of eugenics measures. In the twentieth century, Oliver showed how the state engaged in a neoliberal ‘de-carceration strategy’ that saw the closure of many institutional settings in Western countries. However, this was done in the context of inadequate services that did not allow disabled people to flourish. What remains to this day are massive and inflexible bureaucratic requirements for eligibility for social assistance. It is not uncommon for individuals to entail significant difficulty and repeated rejection in navigating a process that is designed to exclude as many people as possible. Oliver also played an important role in identifying the role of professionals who work with disabled people and build a career providing services that do little to empower them. He was particularly pointed in criticizing middle class professionals whom he felt exploited disabled people, created a culture of dependency, and systematically ignored their life experience. Hence the slogan of the disability rights movement: ‘nothing about us without us’. He also developed interesting insights on the need for disabled people to acquire a consciousness around disability politics. Unusually for an academic, he combined grassroots activism with his scholarly work and was influenced by the work of militant disability organizations such as the Union of the Physically Impaired Against Segregation (UPIAS), which was founded in 1974. Their 1976 manifesto, Fundamental Principles of Disability , articulated many of the distinctions between impairment and disability that Oliver would go on to develop. He fittingly became the first professor of disability studies in Britain. His powerful ideas have influenced an entire generation of disabled people, particularly in the Commonwealth countries, despite the fact that the socialist Left has all too frequently ignored disability rights activism. I was privileged to hear him speak around 1994 at Carleton University in Ottawa in which he spoke about disability rights and referenced Gramsci. This is hardly surprising as Oliver has written eloquently on the ideological construct of individualism. In the disability context, this is manifested through medicalization, the requirements of normality and eugenics (Oliver and Barnes, p.79). While many have since questioned whether the social model adequately integrated identities such as race and gender and whether it adequately encapsulates the experience of those with chronic conditions that involve significant physical pain, the debates still relate back to Oliver’s pioneering work. There is no doubt that there were elements of pessimism in his later work. Oliver thought that the transformation of capitalism was not on the immediate agenda in the face of widespread neoliberal cuts. That understandable pessimism does not diminish the immense value of his transformative model and his legacy. All the writing I have done since then, including my anthology in honour of the late American disability rights advocate Marta Russell, Disability Politics in a Global Economy (2016), and other topics, is predicated on the epistemic foundation established by Oliver. Marta Russell’s landmark book, Beyond Ramps (1998), has undoubtedly been better received in Britain and other countries than in Canada and the United States in part because Oliver’s materialist conception of disablement has wider currency. At the same time few scholars have developed a full-fledged historical materialist theory of disablement as postmodernism dominates current disability studies departments, despite significant contributions by Marta Russell, Sunny Taylor, Jim Charlton, and others. James I. Charlton, Nothing about Us without Us: Disability Oppression and Empowerment (Berkeley, University of California Press, 1998). 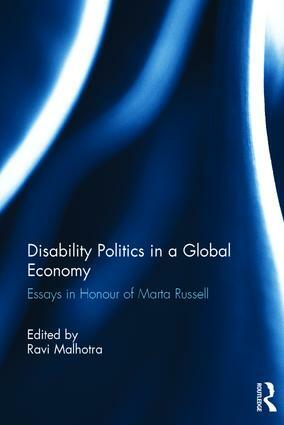 Ravi Malhotra, ed., Disability Politics in a Global Economy: Essays in Honour of Marta Russell (London: Routledge, 2016). 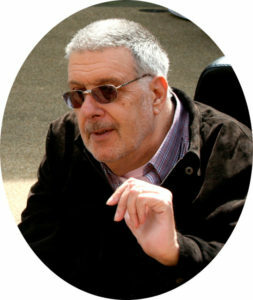 Michael Oliver, Social Work with Disabled People (London: Macmillan, 1983). Michael Oliver, The Politics of Disablement (London: Macmillan, 1990). Michael Oliver and Colin Barnes, The New Politics of Disablement (London: Palgrave Macmillan, 2012). Marta Russell, Beyond Ramps: Disability at the End of the Social Contract (1998, Kindle edition, 2016). Marta Russell and Ravi Malhotra, “Capitalism and Disability,” in Leo Panitch and Colin Leys, eds., Socialist Register 2002: A World of Contradictions (London: Merlin Press, 2001). Sunny Taylor, “The Right Not to Work: Power and Disability,” Monthly Review (March 2004). Originally posted at The Bullet. Adapted from an article in The Nation. Ravi Malhotra is a professor at the University of Ottawa, Faculty of Law, Common Law Section, and a disability rights advocate. You can follow him on twitter at @RaviMalh.